I was such a perfectionist about so many things. The tag on the duvet had to be on the lower right side. Didn’t he know that? He should never throw his floss into the toilet- “It’s not a garbage! It’ll get clogged.” And couldn’t he please find a better way to organize all of those cords and wires coming out of his computer and recording equipment? Such an eyesore! But when it came to our shared tube of toothpaste, I just kept squeezing it from the middle. And often at the top, there would be that excess that dries up and makes it hard to close the encrusted, attached cap. “You have to squeeze it from the bottom and close the top all the way,” he’d say. In the Tribute I got up and spoke at his funeral, I even included this detail, “Who will clean up our toothpaste when I squeeze it wrong and it gets clogged?” And it did start to get clogged- sometime in those first few months of shock. And then one night I looked at it and spoke aloud, “No.” And I picked it up, wiped off the glob of toothpaste at the top, squeezed it from the bottom, and closed it neatly, and forcefully. There were many pivotal moments like this in the year that followed his death. The first weekend of heavy snow, I had to go out and shovel my car and my parking spot in the condo lot with my two year old. I brought books and toys and put her in the car seat while I shoveled, every now and then waving at her with a smile. There was the day I went to the DMV to take his name off the title. After waiting for almost two hours in line trying to entertain my two-year-old daughter, a nasty woman told me I was at the wrong place, “Oh you have to go to probate court for that, honey.” (I loathe when people call me honey in a diminutive way). I knew I had carefully researched the protocol for taking his name off the title, and so I took a deep breath, asked God to help me- out loud- which I think scared the woman a little- and asked to speak to someone else- who it turns out was able to take care of everything in a matter of minutes. And then there was a bill for thousands of dollars I kept receiving from a helicopter rescue company in Switzerland despite the efforts of a lawyer friend who had corresponded with them. So I finally sat down and wrote them a letter myself. The bill was dismissed a few months later. Christina Rasmussen, a widow and author of “Second Firsts,” begins her book describing one of her defining moments. She was eager to get her Christmas cards, but her mail man kept passing by her house without delivering them. She figured it was because of the snow, so she spent time shoveling, but he still drove past. At that moment, she made up her mind to get her Christmas cards, put on her boots, and ran like a crazy woman down the street after the mail truck. The mailman told her she should ask her husband to shovel better. She told him her husband was dead, and walked away with her cards without looking back to see his reaction. She recalls this incident as the beginning of a shift in her life. The moments that truly define us aren’t reactive moments like the ones immediately following a tragedy. They are active. For me they took the form of physical actions, like cleaning up the toothpaste, or shoveling my parking spot. They took the form of words- speaking out a prayer, writing a letter in my defense. They aren’t really even moments as much as they are- decisions. We either decide it’s worth putting up a fight, or we surrender. Sometimes they’re about the bigger things, but usually, more often, they’re about the small stuff. The moments that define us are often quiet. They aren’t displayed on social media accompanied by a quick photo. Often we are the only ones present when they happen. In much the same way that limitation can breed creativity, loss can breed transformation and this enlarging of the soul. In a poetry course in college, the graduate student who taught us would often give us a few items we had to somehow include in the next week’s poem: a day of the week, a name, a color. Though it felt like an assault on my overly romantic yearnings to write poetry at first, later I saw how it stretched my writing and produced things I never would have otherwise. I used the same tool with my own college students later on. Being someone who always struggled to stay under the word limit on papers, etc., I’ve also found a word constraint on my writing forces me to write better and edit out the rambling that gets me to my main point. Even a physical constraint, like the very small room I had as a child, can force one’s imagination. Sitting in that tiny space, I sang and wrote, played with my dollhouse, and pretended for many hours. External limitation can lead to internal growth – if we let it. I recently watched an amazing Ted talk by artist Phil Hansen called “Embrace the Shake.” Mr. Hansen wound up with a tremor and permanent nerve damage in his hands from his pointillism style of art. After a brief time of giving up on his life-long dream of art, his neurologist suggested he “embrace the shake,” and he began discovering all kinds of new techniques he could still do. The art he showcases in the video is breathtaking. “Learning to be creative within the confines of our limitations is the best hope we have to transform ourselves and collectively, transform our world,” says Mr. Hansen in his talk. The loss of my husband, my partner and co-parent made me feel incredibly limited and weak for a long time. Those crucial moments of decision kept coming even a few years after the loss. Transformation doesn’t happen in one magical life-changing moment, though some self-help books and gurus will try to convince you otherwise. It happens over a span of time, with each decision and each victory. So, let me share with you one more of those. After I moved from the apartment I had lived in with my husband, I bought a very large new dining table from IKEA. I had a small dining room for the first time, and I’d always dreamed of having a large farmhouse-type table that would be the heart of my home. (I also thought with a sheet over it, it’d make an awesome play space for Audrey). Despite the fact that the instructions showed two tiny stick people were necessary to put together the table, I decided to put it together myself while Audrey was at her grandparents’ house. The table was constructed on its face, upside down, and when I was finished assembling it, the final step was to have person #2 help you turn it right side up. Finding that impossible because of its size, I despaired at first and had a moment or two of self-pity. I had only managed to get it on its side. After spending a whole afternoon putting together the table in a valid attempt to recreate a sense of home for us, my daughter would return to find a massive upside down table in the middle of the room. But after some thought, I decided to prop the table up with my leather couch pillows on one side so that I could gain enough leverage to push it up the rest of the way. It worked. What at first seemed an impossible constraint, pushed me out of the box in my thinking and problem solving. Making the choice not to sit in self-pity, but to fight for what I wanted, enlarged my soul. “When I am weak, then I am strong,” said the Apostle Paul. I still have a lot more enlarging to do, and I’m sure there have been moments when I’ve made the wrong decision. But the great thing is, I don’t really remember those. It’s the fighting moments that stay with us. And I think it’s OK to go back over those on a day when you’re not feeling so strong. Recently, a friend shared a song on Facebook called “Fight Song,” and when I went to listen to it, I realized that I know the artist. My husband had played with her for a number of years while she was still struggling to “make it,” and I often sat in music venues on the Lower East Side listening to them. At that time, he was stretching himself thin at a regular 9-5 job and playing with artists and his own band a few times a week so he was selective with who he played with, and he promised me Rachel had the potential to really make it big. So, it was with joy and some bittersweetness that I discovered she had. I played the song for Audrey, and she immediately picked out the notes on the piano and sang along. It’s a great anthem- though I admit it wouldn’t have spoken to me at all when Dan first died. Not all moments are “fighting” moments. At first, when I discovered Rachel’s success (I don’t really follow music anymore), I was filled with a sad nostalgia for the days I sat in that music venue listening to them play. I was filled with sorrow wondering where Dan’s career would’ve been by now- he had already achieved so much at the time of his death. I was filled with incompetence- how to nurture and train my child who seems to have a strong musical talent like her dad. I was disappointed that she couldn’t be around the musicians she would’ve been around had he been alive. But then it became one of those moments of decision- to stay in self-pity, or take action- wipe the tooth paste off, close the cap, prop the pillows up and get some leverage on that enormous table totally unnecessary for two people. I wrote Rachel, congratulated her on her success and asked her if she’d meet with Audrey to maybe play piano or sing. In her reply, she was more than gracious, sharing my sadness. Audrey’s excited to meet her. Not all moments are “fighting” moments. But some are. Having a child has helped me keep fighting even when I felt exhausted, because when your child has lost something you can never get her back, you want desperately to hold onto anything else that you can. When the defining moments come, when you have that choice, you have to choose to fight, to enlarge your soul rather than let loss or life shrink it. Keep your eyes open and your heart attuned- they are often small, subtle moments, these fighting moments, and you just might miss them. * I had to show you my weekly flowers in the photo above. I have heard from many of you who have added this tradition to your own weekly grocery list. 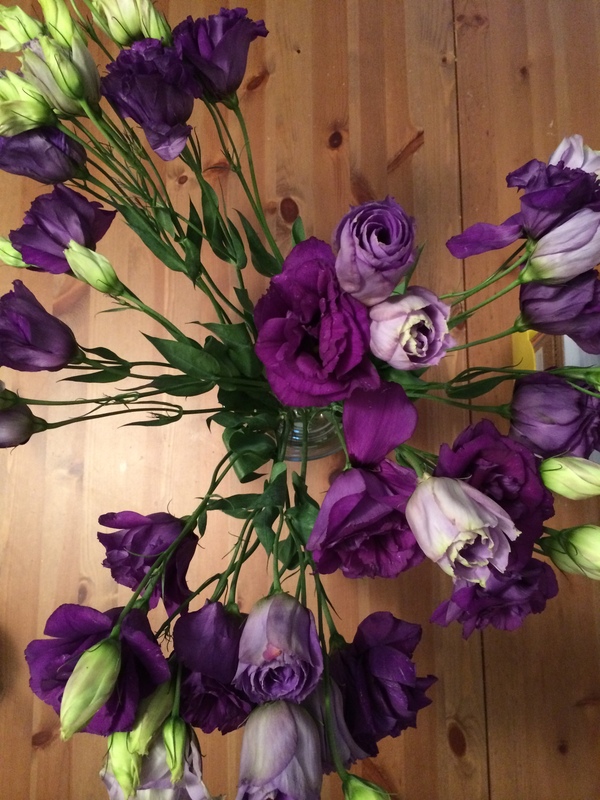 I can’t stop admiring these Lisianthus flowers on my dining table and they were just $4.99 at Trader Joe’s. I’m feeling so emotional reading this post, your story of the toothpaste, what you said at your husband’s tribute, just hit me in the heart. Those little things that don’t matter until they do. Then the couch story and that gorgeous powerful song. I watched the video and it made me tear up, it’s so beautiful and haunting, but I thought of you listening to it, recognizing her voice, and the added layers of complexity and heartbreak. But what you did instead of wallowing made me cry. Your girl, that artistic budding musician, that brave performer, has you to help guide her and fight for her. It’s not enough and it’s not at all fair. But you do it for her. You fight for her and from the over her, from way over on the other side of the screen, it looks like you’re doing a damn fine job. I always love your posts. They are so written from the heart. That touches me in the heart. Thank you so much for that. And thank you for taking such good care of yourself and your daughter. For enlarging your soul. For sharing that here. This post was waiting on my laptop for about a week. I didn’t have the quiet time to read it. And today I did and it was the perfect time to read it. This post touches me because the last few days I am working on, thinking and feeling about making that choice to fight for what you want, to enlarge the soul, instead of shrinking and giving up. The quote “When I am weak, then I am strong,” is so beautiful. I am learning to see that not having all the perfect circumstances or personal characteristics, doesn’t mean I should give up on what I want from the soul. When I’m weak, then I am strong. Do you still sing yourself? Thank you Anna. I love when things come to us at just the chosen time. I’m glad this spoke to you accordingly. The quote is from 2 Corinthians 10.12. I haven’t sang very much at all in the last 7 years. My daughter and I do sing a lot together in the house, and now that she plays piano by ear, I’ll get out my guitar and sing and she’ll join in on piano. Love your writing! I have to have the tag on the left upper corner. I too squeeze from the bottom up. I too turn my husband on his side when he snores. ” It is not what happens to us that matters as much as what happens in us” < love this quote! You will always fight for your girl! Keep writing! keep fighting! You fill me with so many emotions — you inspire me to think deeper, love harder, believe stronger. Your writing is your fight song. And it makes me want to fight. My daughters love that song and we blast it. Now I will be tearful when I think of your connection to Rachel but I will also be uplifted. You are incredible. Don’t ever stop fighting. Thanks Rachel…Audrey loves that song too. So good to hear from you yesterday.